For anybody that made a resolution to replace sugary snacks with kale shakes back when that ball dropped in January... well, you can forget about that, because Carl's Jr. just unveiled its resolution-breaking trump card. 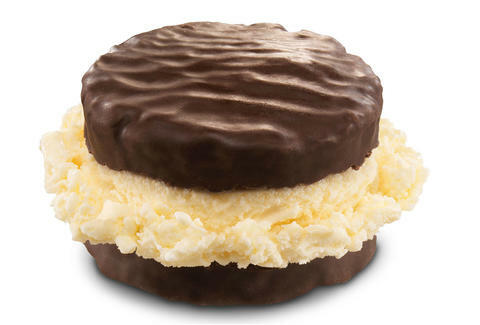 Meet the Hostess Ding Dong Ice Cream Sandwich, aka the most American Ice Cream Sandwich ever. The concept couldn't be simpler: take a chocolatey Ding Dong snack cake, split it in half, and fill in the middle with a hefty scoop of vanilla ice cream. The resulting sugar-splosion is enough to make Wilford Brimley pronounce "diabetes" properly, and at $1.49 each, it's pretty hard to justify not stockpiling these things in anticipation of the day Carl's Jr. inevitably stops serving them. On the plus side, though, there's enough innuendo potential in these cream-filled frozen Ding Dongs to keep you entertained long after they're gone. Hit up your nearest Carl's Jr. to pick up one (or 10) of these bad boys, or watch and laugh as people try to eat them without getting chocolate everywhere.